The Heywood-Wakefield company — still in business today — has added four new furniture designs to their growing list of reproductions made new today. One of the most popular vintage designs, the M 392 G Square Cocktail Table is now more useful than ever with the addition of a small drawer that fits nearly-invisibly under the table top and opens from either side! Ideal for TV remotes, pen and paper, program schedules and miscellaneous items you d like to have handy in the den or living room. 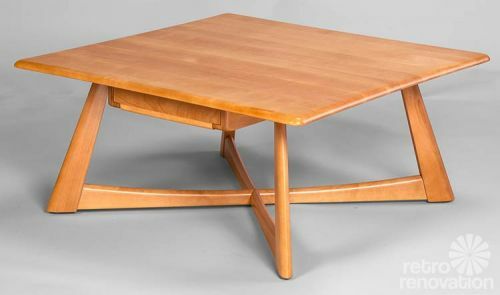 The table measures 36 inches square and stands 16 inches high. The M 179 Tambour Utility Case measures 32.5 inches high x 24 inches wide x 17 inches deep. The doors disappear into the sides of the case allowing easy access to the contents. It is ideal today to house DVR and sound components; you can hang your flat-screen above it or place a smaller one on a stand on the top. We will pre-drill wire-access hole(s) in the back or you can do this yourself; the back is removable with screws. Two fully-adjustable interior shelves are included. 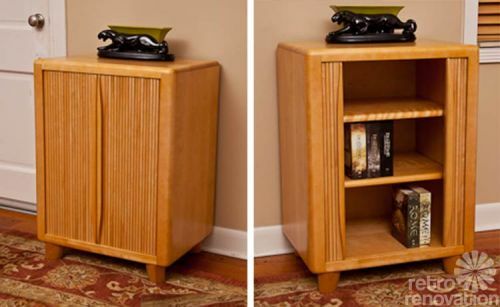 By coincidence, the interior is the perfect size and shape to hold a vinyl record collection – more than 250 LPs will fit! 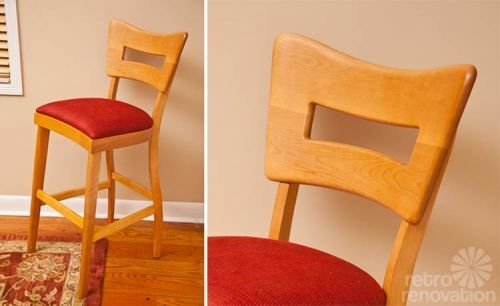 The iconic M 154 A Dining Arm Chair is perhaps the most recognizable Heywood-Wakefield chair. In response to many requests, we’ve added this great M 154 A-HS Bar-Stool to our line-up. Measuring 30 inches from the floor to the seating area, it features the same instantly-recognizable open backrest and undulating back leg, which is a one-piece solid-wood upright. The entire stool is solid 100% North American birch. Black or red upholstery fabric is included with the stool, or you may specify your fabric or one of ours instead. If you choose this option, the cost of the fabric is extra but installation of the fabric is included. Just send it to us! The pre-WWII C2927 – End Table, originally in production from 1936-38, is a very functional and useful piece for any room, but especially so where space is at a premium. It has a 21″ x 11″ footprint, and stands 21″ high. Fits great with any room featuring and Art Deco motif. Leonard tells me that there are more new designs in the works, including the option to buy replacement parts. Disclosure: Heywood-Wakefield is currently an advertiser here — but this story is not part of the deal or anything. Just checked these out on their site and as much as I love all of it, the prices are ridonkulous. $1095 for that tambour case (which I wanted soooo bad)? Love Hey Wake – I snoozed and didn’t get my fave find uploaded, a HW bureau in platinum finish for $40. I like MCM, saw the bureau on Facebook, had a friend go get it in his truck for another $10 and when I was helping unload it I saw the marking inside the drawer – score! Great condition, it was the woman’s grandmother’s piece, she had no room, no use for it. I think Room and Board is pricey. I would love to have the Tambour Utility Case for my albums but there’s no way I can pay the price, unless I win the lottery. 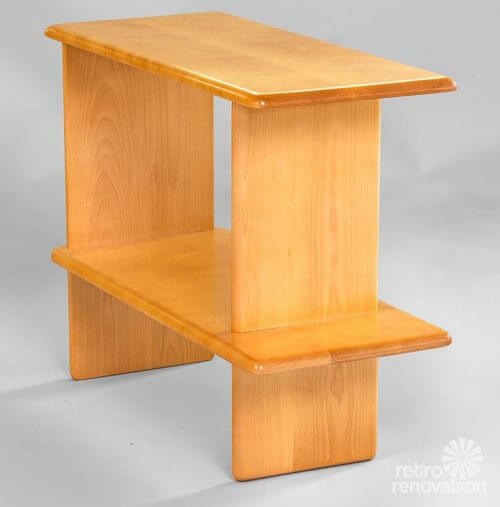 I have a pair of Craftsman Era oak end tables, rounded, three shelves that I don’t use but people don’t appreciate their value so they sit in my basement collecting dust. 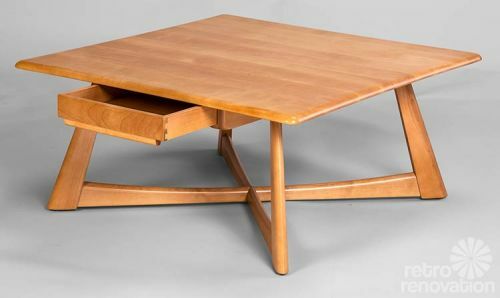 Lastly, I have my mom’s MCM veneer bureau with one matching dining chair, it has a diamond shape back cutout and original upholstery, it’s a beautiful chair.